At Elite Smiles Chastain, we pride ourselves on being able to provide high quality, comprehensive pediatric dentistry and orthodontic treatment in one convenient location in the Chastain Park area of Atlanta, Ga. Our orthodontist, Dr. Michael Sebastian is passionate about helping his patients achieve healthy and beautiful smiles they can enjoy for a lifetime. At our practice, your teenager is given many great options for improving his or her smile including all the most popular types of braces and Invisalign clear aligners. When you visit our office, you may notice many teenagers coming and going, partly due to the fact that adolescence is considered the optimal time to receive orthodontic treatment. During adolescence, most of the permanent teeth are in, allowing orthodontists like Dr. Sebastian to correct common problems like improperly spaced teeth, “bad bites”, and misaligned teeth. Because the jaw and bones of the face are still developing during adolescence, it is easier for our Chastain orthodontist to treat problems during this stage of life due to rapid body growth. Once the facial bones and jaws are done developing, many orthodontic problems become more difficult and costly to treat. When your teenager is seeing us for orthodontic treatment, it’s likely he or she will run into friends and classmates in our office because adolescent treatment is so common. Once your teen is finished with treatment, he or she will be smiling like never before! In addition to having a better-looking smile, your teenager’s overall oral health will improve, paving the way for fewer dental problems in the future. Diagnostic records will be taken of the teeth so our Atlanta orthodontist can see what’s happening underneath the gums. Dr. Sebastian will perform a careful examination and ask your teen some questions like if he or she hears sounds coming from the jaw when eating or if there are problems biting or swallowing. Using the diagnostic records and the information he gathers from the exam and discussion, Dr. Sebastian will make a proper diagnosis and create a customized treatment plan. 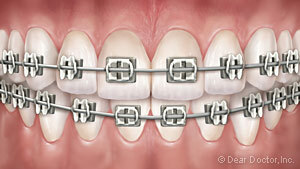 Metal braces: The most common type of braces made of high-grade stainless steel which are bonded to the teeth. 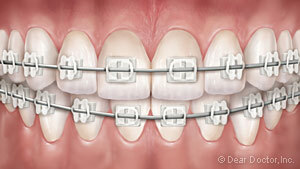 Today’s modern metal braces are smaller, more comfortable, and more attractive than the metal braces used years ago. Clear braces: These braces work like metal braces but they’re more discreet. Clear braces have brackets made of a translucent ceramic material, allowing them blend in with the natural color of the teeth. 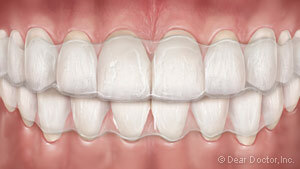 Invisalign Teen: This is a discreet and convenient way to improve a smile using a series of clear, removable aligners. Invisalign Teen is perfect for busy teenagers who don’t want to wear visible braces or have their orthodontic treatment interfere with their active lifestyles. The exact amount of time your teen will spend in treatment all depends on the severity of the problem your teenager has. Generally speaking, the active stage of orthodontic treatment lasts from 6 to 30 months. Once your teen is finished wearing braces or aligners, they will begin the retention stage of treatment, which involves wearing a custom-made retainer. Then it’s all about enjoying a lifetime’s worth of happy and healthy smiles! Treat Your Teen to the Best! Visit Our Buckhead Orthodontist! If your teenager could benefit from orthodontic treatment, naturally you want treatment to come from an experienced orthodontist with an outstanding reputation for creating amazing smiles. You simply cannot find a better Chastain or Buckhead orthodontist than Dr. Sebastian. He’s been perfecting smiles for over three decades using all the latest orthodontic techniques and appliances. Call our office today at (404) 303-7400 or request an appointment online to set up your teen’s first visit with us! We look forward to meeting you and your teen soon!